Brick Rose Beds & Donuts is not your typical bed & breakfast, it's a "Beds & Donuts", and here's why.... Brick Rose is a property where you rent the entire home, not just one bed, but ALL the beds. Hence, the "Beds" part of Beds & Donuts. Oh, and I'm not great at making breakfast, in fact, I would probably burn your toast! So, instead, I bring you a dozen donuts the morning after your arrival. Who doesn't like donuts?! This is how we came up with "Beds & Donuts" for Brick Rose. A little background on the property... Brick Rose is a large historic home built in 1895 located in the heart of wine country, Washington, MO. My husband and I are thrilled to have the opportunity to own this historic home and put our mark on it! We both grew up in Washington and neither of us had ever seen the house or noticed it. What's crazy is that it's located right on top of Washington's main drag, 5th Street, a very traveled spot, but the trees and shrubs kept this beautiful home from being seen by many locals for years! It was used as a personal home for over 100 years and what is now the Milq Room (aka Mother-in-Law Quarters) was used as a veterinary office for over 50 years by two different veterinarian doctors! The home was recently fully restored to its original beauty, and then some! It features 5 full bedrooms: 3 bedrooms on the 2nd floor, a master suite on the 3 floor, and a large bedroom/in-law quarters on the main floor approximately 4 steps down from the dining room (the Milq Room). Each of the 4 bathrooms are full bathrooms, with one on each floor, except the 1st floor, where there are 2! Our goal was to make Brick Rose Beds & Donuts not just a vacation home, but like a little antique shop full of eclectic items that are sure to start conversation! The back yard is complete with a built in concrete pool and hot tub with convenient off street parking for 6+ vehicles. 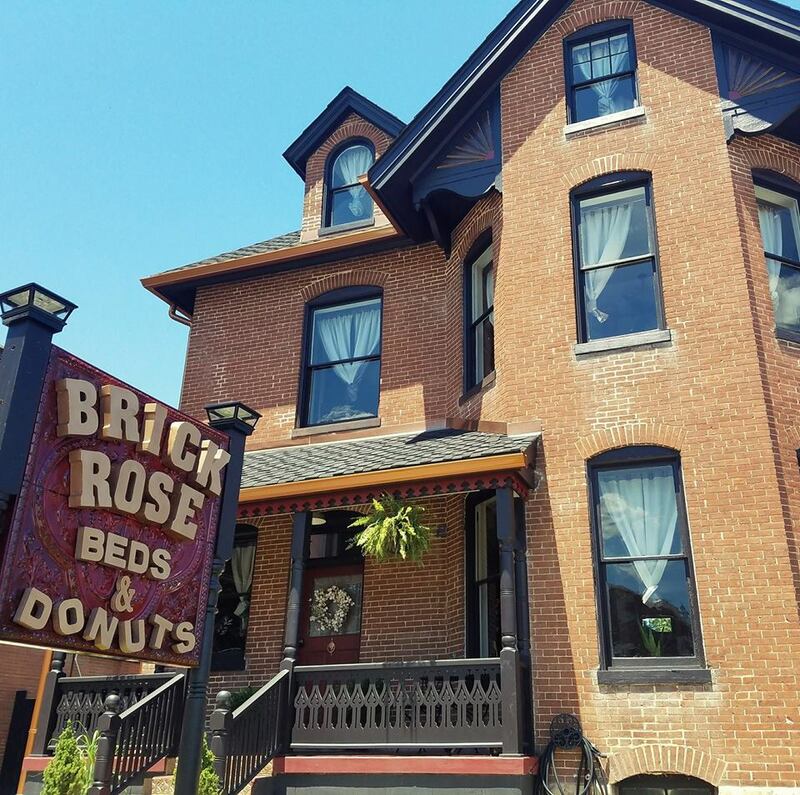 We are thrilled to share Brick Rose Beds & Donuts with vacationers and locals alike! Working on this restore/rehab project has been like no other and we couldn't be happier with the gorgeous results and wonderful reviews! "The bathrooms and bedrooms are beautifully updated while maintaining the historical flare of the home. You can tell there's been a lot of hard work put into this gorgeous home."